Note: We first published a valuation based market forecast in September of 2010. At that time we used only the Shiller PE data to generate our forecast, and our analysis suggested investors should expect under 5% per year after inflation over the subsequent 10 year horizon. Over the 40 months since we have introduced several new metrics and applied much more comprehensive methods to derive our forecast estimates. Still, our estimates are far from perfect. From a statistical standpoint, the use of overlapping periods substantially impairs the statistical significance of our estimates. This is unavoidable, as our sample only extends back to 1926, which gives us under 90 years to work with, and our research suggests that secular mean reversion exerts its strongest influence on a periodicity somewhere between 15 and 20 years. As a result, our true sample size is somewhere between 3 and 4, which is not very high. Aside from statistical challenges, our analysis potentially faces issues related to changes in the way accounting identities have been calculated through time, changes to the geographic composition of earnings, and myriad other factors. In response to questions raised by thoughtful analysts in recent research, we have integrated new earnings series from Bloomberg and S&P into our Cyclically Adjusted PE calculation. Primarily, the new series adjust earnings for changes to GAAP rules in 2001 related to corporate write-downs. Each of the series has merit, so we took the step of averaging the three series. I’m sure bulls and bears alike will find this method intensely unsatisfying; we certainly hope so, as the best compromises have this precise character. It’s worth noting that the new earnings series do not alter the final regression forecast model results because our multiple regression model rejects the Shiller PE as statistically insignificant to the forecast. That is, it is highly correlated with, but less significant than, other series like market cap/GNP and q ratio. This has been the case from the beginning of this article series, so it isn’t due to the new earnings data. Nevertheless we include regression parameters and r-squared estimates for all of the modified Shiller PEs in the matrixes as usual. The bottom line is that, despite statistical and accounting challenges, our indicators have proved to be of fairly consistent value in identifying periods of over and under-valuation in U.S. markets over the full 90 year period, notwithstanding the last two decades. We admit that the two decades since 1994 seem like strange anomalies relative to the other seven decades; history will eventually prove whether this anomaly relates to a structural change in the calculation of the underlying valuation metrics, a regime shift in the range of possible long-term returns, or an increase in the ambient slope of drift. Lastly, I am struggling to reconcile a conundrum I identified very early in the development of this model. Namely, the fact that the simple regression of real total returns with reinvested dividends carries very different implications than the suite of other indicators we have tested. I am troubled by the theoretical veracity of incorporating dividend reinvestment for extrapolation purposes, because the vast majority of dividends are NOT reinvested, but rather are paid out, and represent a material source of total income in the economy. However, the trend fit is surprisingly tight, and I can’t say with conviction that the trend fit isn’t valid for those investors who are reinvesting dividends. It is a puzzle. Above all, any analysis that relies on the past to offer guidance about the future makes the strong assumption that the future will in fact resemble the past. We have no guarantee that this will be the case. Many optimistic analysts assert that the invention of central banking, global communications and trade, robotics, 3D printing, Paul Krugman, or any number of ‘game changers’ that have evolved over the past few decades renders comparisons with our past misguided. Surely we won’t make the mistakes of our ancestors; there will be no more war, no misguided political decisions, no shortsighted thinking, no natural disasters, no panics or conflicts or excesses which derail our arc toward ever-increasing prosperity. Again, we are not making a forecast of market returns over the next several months; in fact, markets could go substantially higher from here. 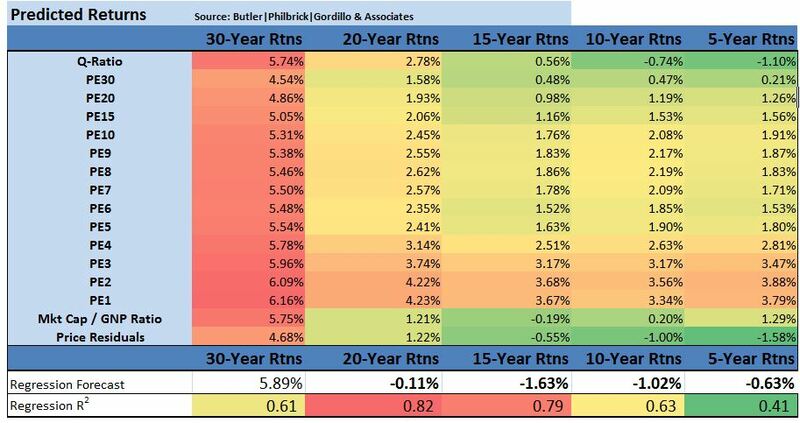 However, over the next 10 to 15 years, markets are very likely to revert to average valuations, which are much lower than current levels. This study will demonstrate that investors should expect 6.5% real returns to stocks only during those very rare occasions when the stock market passes through ‘fair value’ on its way to becoming very cheap, or very expensive. At all other periods, there is a better estimate of future returns than the long-term average, and this study endeavours to quantify that estimate. This forecast is also supported by evidence from an analysis of corporate profit margins. In a recent article, John Hussman published a long-term chart of U.S. corporate profits as a percent of GDP, which demonstrates the magnitude of upward distortion endemic in current corporate profits, which we have reproduced in Chart 1 below. Companies have clearly been benefitting from a period of extraordinary profitability. Matrix 4. shows forecast future real returns over each time horizon, as calculated from the slopes and intercepts above, by using the most recent values for each valuation metric (through November 2013). For statistical reasons which are beyond the scope of this study, when we solve for future returns based on current monthly data, we utilize the rank in the equation for each metric, not the nominal value. For example, the 15-year return forecast based on the current Q-Ratio can be calculated by multiplying the current ordinal rank of the Q-Ratio (1313) by the slope from Matrix 2. at the intersection of ‘Q-Ratio’ and ’15-Year Rtns’ (-0.000086338), and then adding the intercept at the same intersection (0.118956942) from Matrix 3. The result is 0.0056, or 0.56%, as you can see in Matrix 4. below at the same intersection (Q-Ratio | 15-Year Rtns). Finally, at the bottom of the above matrix we show the forecast returns over each future horizon based on our best-fit multiple regression from the factors above. From the matrix, note that the best forecast for future real equity returns integrating all available valuation metrics is less than 1% per year over horizons covering the next 5 to 20 years. We also provided the R-squared for each multiple regression underneath each forecast; you can see that at the 15-year forecast horizon, our regression explains almost 80% of total returns to stocks. 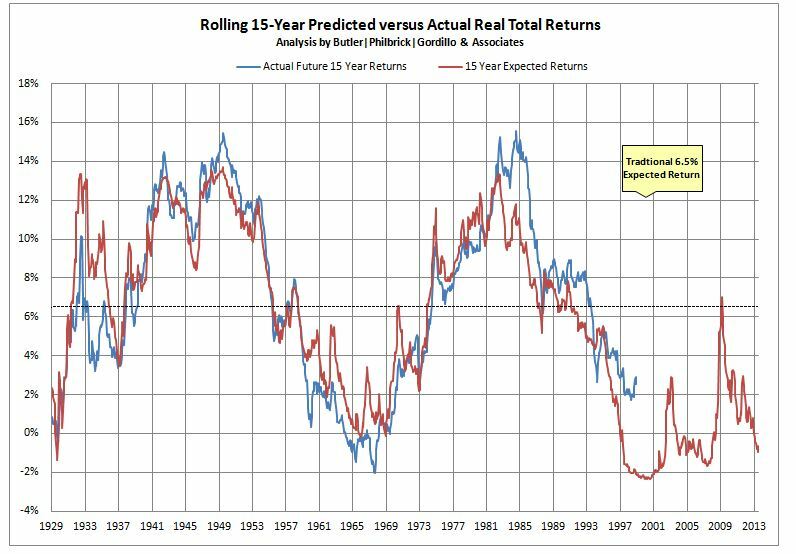 You can see that 15-year “Regression Forecast” returns are -1.63% per year using market valuations as of November 30, 2013. You can see we tested against periods during the Great Depression, the 1970s inflationary bear market, the 1982 bottom, and the middle of the 1990s technology bubble in 1995. The table also shows expected 15-year returns given market valuations at the 2009 bottom, and current levels. These are shaded green because we do not have 15-year future returns from these periods yet. Observe that, at the very bottom of the bear market in 2009, real total return forecasts never edged higher than 7%, which is only slightly above the long-term average return. This suggests that prices just approached fair value at the market’s bottom; they were nowhere near the level of cheapness that markets achieved at bottoms in 1932 or 1982. As of the end of November 2013, annualized future returns over the next 15 years are expected to be less than zero percent. We compared the forecasts from our model with what would be expected from using just the long-term average real returns of 6.5% as a constant forecast, and demonstrated that always using the long-term average return as the future return estimate resulted in 350% more error than estimations from our multi-factor regression model over 15-year forecast horizons (1.17% annualized return error from our model vs 5.49% using the long-term average). Clearly the model offers substantially more insight into future return expectations than simple long-term averages, especially near valuation extremes. Returns in the reddish row labeled “PE1” in Matrix 4 were forecast using just the most recent 12 months of earnings data, and correlate strongly with common “Trailing 12-Month” PE ratios cited in the media. Matrix 1. demonstrates that this trailing 12 month measure is not worth very much as a measure for forecasting future returns over any horizon. However, the more constructive results from this metric probably helps to explain the general consensus among sell-side market strategists that markets will do just fine over coming years. Just remember that these analysts have no proven ability whatsoever to predict market returns (see here, here, and here). This reality probably has less to do with the analytical ability of most analysts, and more to do with the fact that most clients would choose to avoid investing in stocks altogether if they were told to expect negative real returns over the long-term from high valuations.